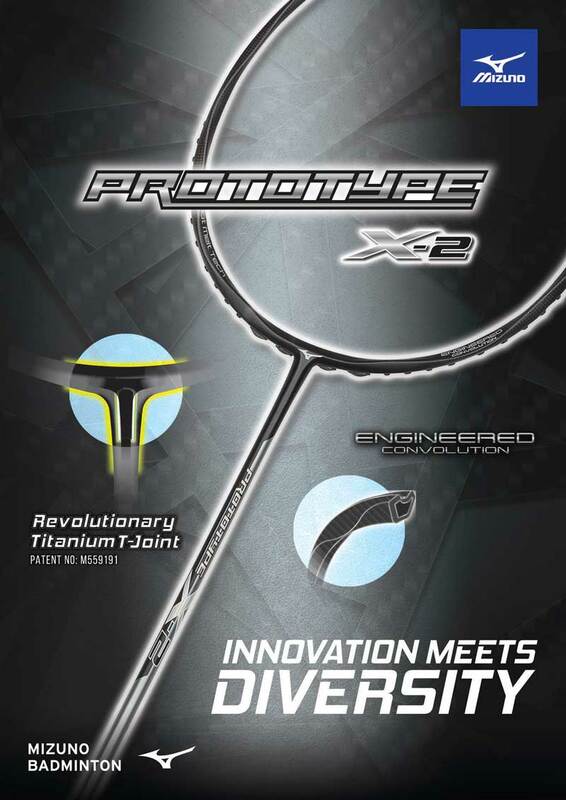 The Mizuno Prototype X2 introduces a manufacturing breakthrough in racket frame construction. The introduction of the Engineered Convolution construction that is systematically positioned over the 3D Power Matrix fortified Japanese HMG T46 frame, is further enhanced with the conjoining of the patented new Revolutionary T-Joint for lateral support. This unification creates a racket that is swift to recover from attack to defence in an effortless transition, for the ultimate versatility and maneuverability on the court. The ergonomically contoured shape of the frame strengthens the structural integrity and reduces unwanted drag. This results in an increase of power that does not alter the frame’s stability generating powerful and precise shots. The unique shape of the frame allows a more nimble response from fast attack to pinpoint net play without compromising the element of control. A precision tooled Titanium barrel connecting the frame to the shaft is embedded with carbon particles to reduce vibration and strengthen the fusing of the two. This construction reduces torque from both frame & shaft as well as the lateral twisting of the frame in off-center shots for a better transfer of power and control.